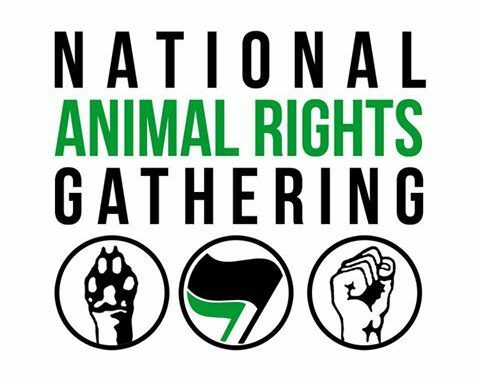 This year’s Animal Rights Gathering will again be taking place as a strand within the Earth First! Summer Gathering. 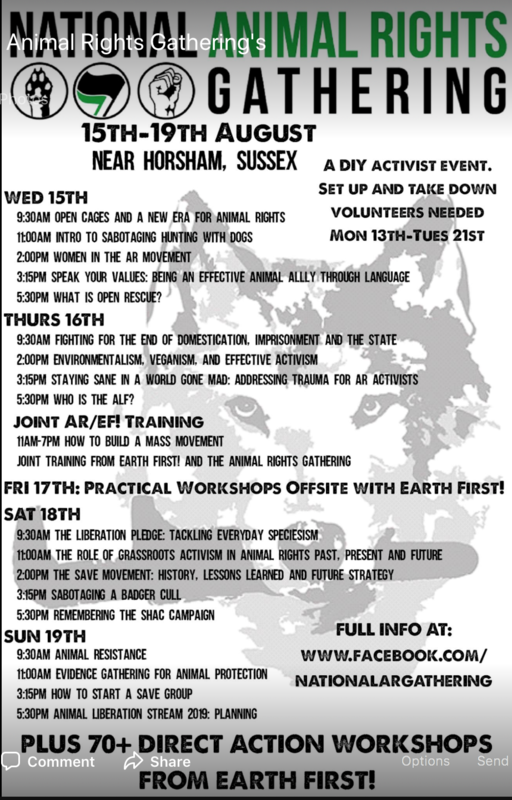 It’s five days of grassroots direct action skill-sharing from 15-19 August at a site near Horsham in West Sussex. For all animal liberation, animal rights and vegan activists past, present and future – make links, share ideas, learn and plot for animal liberation! The ethos is DIY so people are encouraged to get involved in the running of the event themselves. There is no paid staff, no organising hierarchy, no big budget, everyone’s a volunteer. Please join the spirit and take the initiative to help, or offer to help with whatever you see that needs doing. Cost will be £5 per day for food (all of which is vegan) and anything from £5 to £50 towards the cost of the camp but no-one will be turned away who cannot afford to pay. 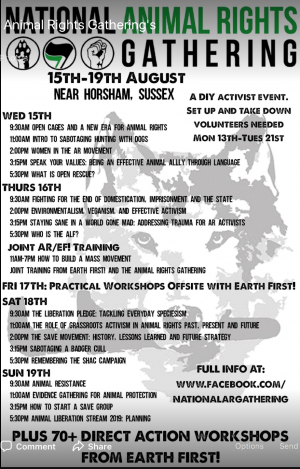 Workshops will include: introduction to hunt sabbing, tackling everyday speciesism, the liberation pledge, funding AR actions, the Save movement, the badger cull, mapping the scene: AL, AR and veganism, speak your values and veganism in law. There will be loads more – including over 100 workshops from EF!